Best Recipes From the Backs of Boxes, Bottles, Cans and Jars: If This Is “Best,” What Didn’t Make the Cut? It’s time for another Recipes of the Damned offering, this one a cookbook extolling the virtues of processed food. More specifically, this book is a compilation of recipes found on product labels. The premises of the book seem to be that a) People use a lot of processed foods, b) People who use a lot of processed foods actually read the recipes on the packages and want to make them again but don’t think to write them down, and c) These recipes are actually worth cooking and eating. Perhaps I am being too snarky. After all, my chocolate chip cookie recipe is memorized from the one printed on the chip bags. The companies do invest in product research and recipe development, and the results can’t all be bad. However, a perusal of Best Recipes From the Backs of Boxes, Bottles, Cans and Jars suggests that a good 80 percent of them are dubious at best. This book is a horror show.¬† Hiram Walker’s Supreme Brandy Burgers. Hot Mexican Beef Salad, featuring Kraft Catalina Dressing. Innumerable gelatin salads and desserts. And the salty, cardboardy funk of powdered onion soup mix permeating everything. They are right about it being extra-easy. 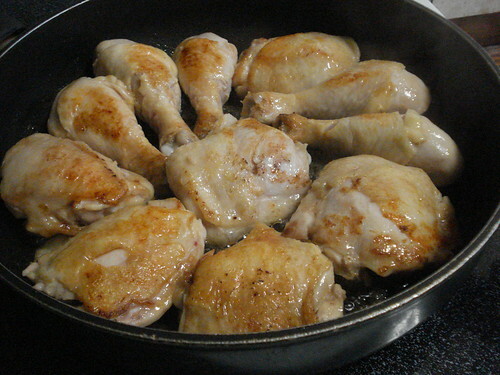 The recipe calls for browning chicken pieces in butter, adding a mixture of half Heinz 57 and half water, covering the pan and simmering for 30 minutes, then removing the lid and cooking 10 minutes longer. 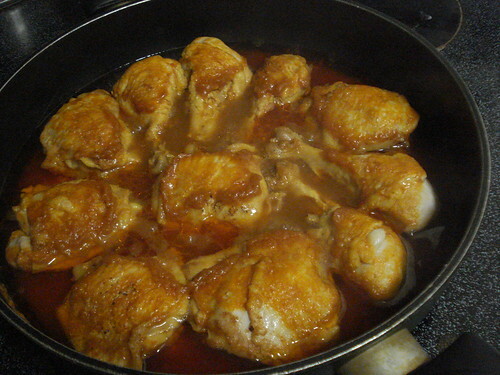 At this point the chicken is removed and the excess fat skimmed from the sauce, and dinner is served. 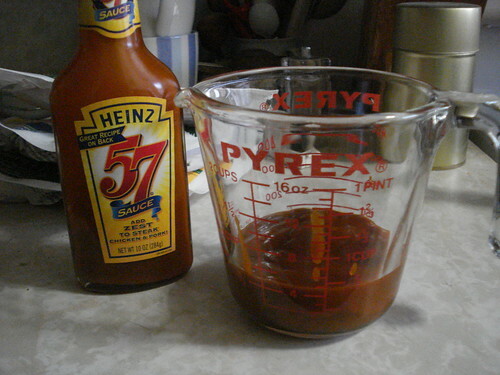 Heinz 57 sauce is kind of scary stuff. The second ingredient listed is high fructose corn syrup, and it includes both raisin concentrate and apple concentrate. (Aren’t raisins already kind of concentrated?) It’s basically ketchup with fruit and vinegar added. The tangy flavor is pleasing, but I couldn’t really shake the knowledge of the high fructose corn syrup. 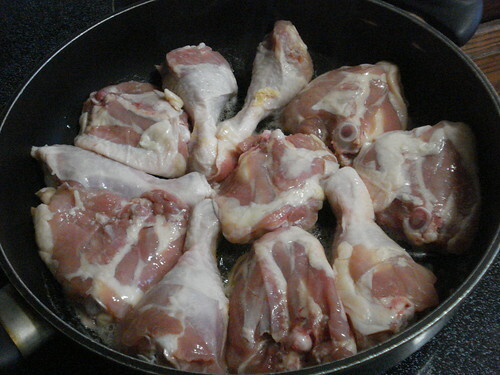 So, I browned the chicken pieces. 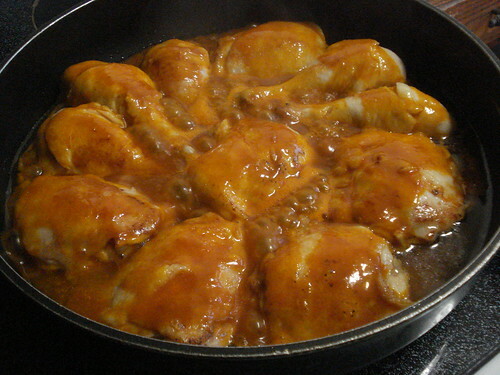 I mixed Heinz 57 with water and added it to the pan, where it combined with the melted butter to coat and stew the chicken. I removed the lid to let the excess moisture cook away. 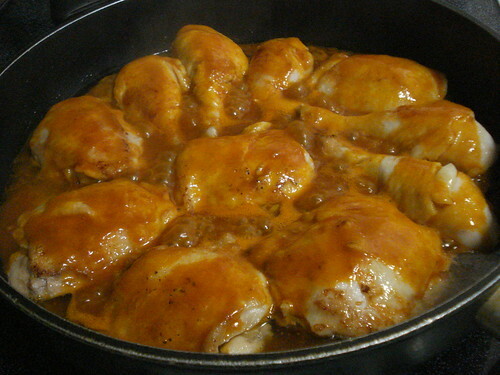 I skimmed as much fat as I could from the sauce, then spooned some over the chicken. 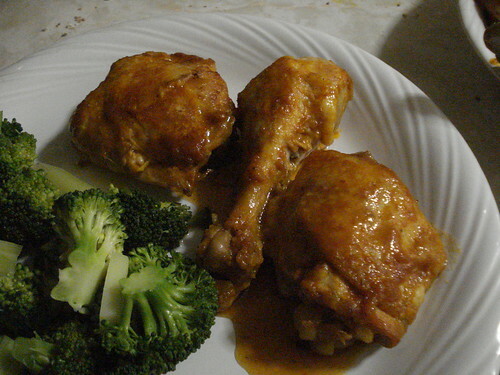 I served it with steamed broccoli and a warmed loaf of Italian bread. The chicken tasted pretty good; the meat was tender, and the sauce was in fact tangy. 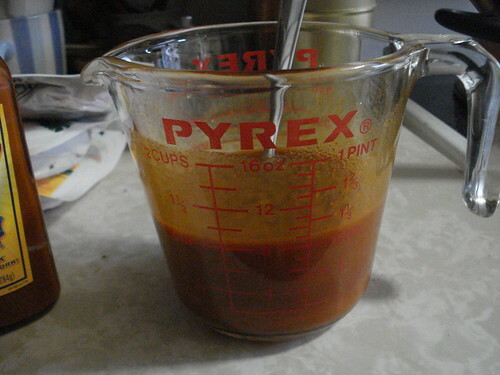 But I suspected I could make an even better version from scratch pretty easily with tomato puree, honey or molasses, and cider vinegar, and no HFC. 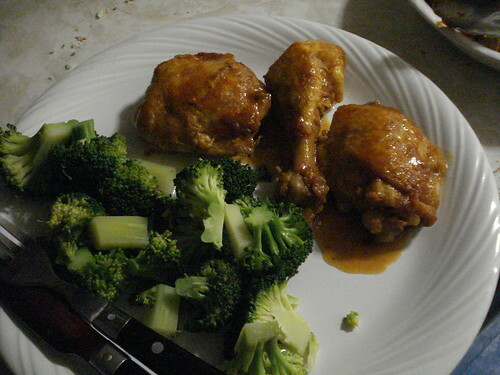 In fact, I decided the main thing I’d learned from this one was a basic cooking technique: brown the chicken (in half the fat next time, perhaps using part olive oil), add the sauce, cover, cook, uncover, cook some more. 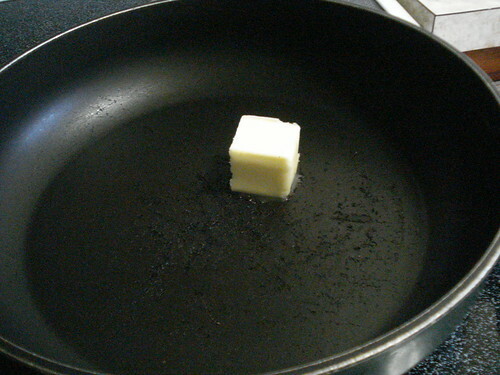 The possibilities are endless, and they don’t involve this cookbook. Verdict: Good enough. I don’t expect to make this again, though I do have to decide what to do with the remaining half-bottle of Heinz 57.